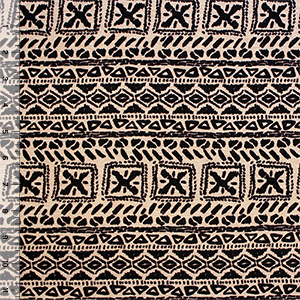 Ethnic inspired emblems and marks in chocolate brown on a cocoa colored background cotton jersey rayon blend knit. Fabric is light to mid weight, with a nice stretch, and soft fluid drape. Largest symbol measures 1 1/4" (see image for scale). A versatile fabric that is great for many uses!